The Selective Laser Sintering is a technique of laser prototyping that employs thermoplastic powders of materials sintered by using a laser beam. Thanks to the rollers, the powders are spread and compacted, the laser scan will then heat them up to a temperature slightly lower than the melting one, just covering up the area identified by the slicing, without any interest for the rest of the powder, and thus creating all the parts of the item, based on the forms prepared through the 3D software. At the end of the production, the extra powder that is not sintered is removed. Then the item can be refined through shaving removal procedures, colouring or metal plating. This technology enables to accelerate significantly the prototyping processes, to handle quickly possible changes and to realise complex shapes, even with internal holes and cavities, hardly feasible using traditional technologies. Thanks to SLS, indeed, it is possible to obtain high-performance prototypes, with functional characteristics similar to the final material for assembly checking, for size amd shape tests. This is making possible to study a project and its development prior to the production, in order to evaluate the functionality or the design of a product in a very flexible way. According to the selected material (Alumide, Polyamide, Glass-filled polyamide, Carbonmide or Rubber-like), it is possible to obtain items that can offer mechanical performances or items that are simple models. Moreover, this technology is also really popular among companies that does not require a large-scale production, and sometimes the rapid prototyping is used for “micro-productions”, aimed at creating a set of items (even non-identical items), without the need for moulds and other machinery. Rapid prototyping differs from traditional mechanical manufacturing processes that work by substraction of material. In substractive manufacturing, the desired shape is obtained by removing pieces from a block of raw material; whereas in additive manufacturing, such as Rapid Prototyping techniques, the items are created by adding material layer by layer. SLS printer with two lasers for the production of large parts and for industrial high-throughput manufacturing. 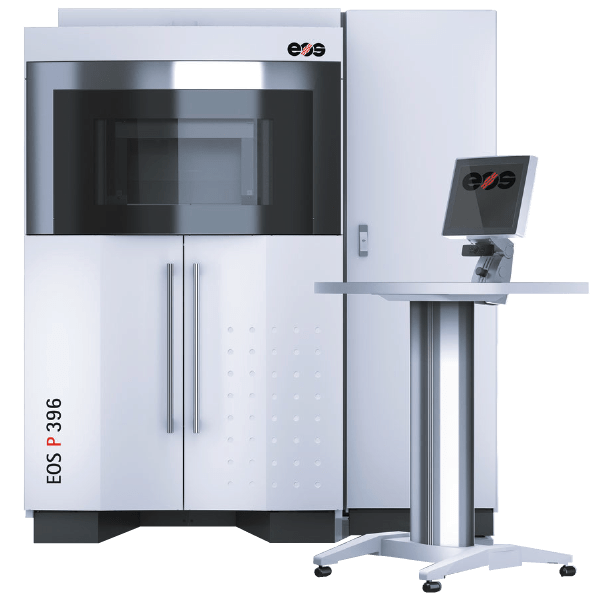 Prosilas is the first company in Italy that produces with the EOS P770, a next-generation 3D printer tested at the end of August 2017 that, with a building volume of over 150 liters (a record for the 3D technology), boasts a production capacity up to 20% higher than machines of the same category at equal quality.Thanks to the optimized temperature management, to the improved recoating speed and to the high-power lasers, the build time are significantly reduced. The improved digital scanners reach an unrivalled accuracy, allowing an overlap area with no visible edges. System forlaser sintering for serial parts and functional prototypes production from polymer materials. 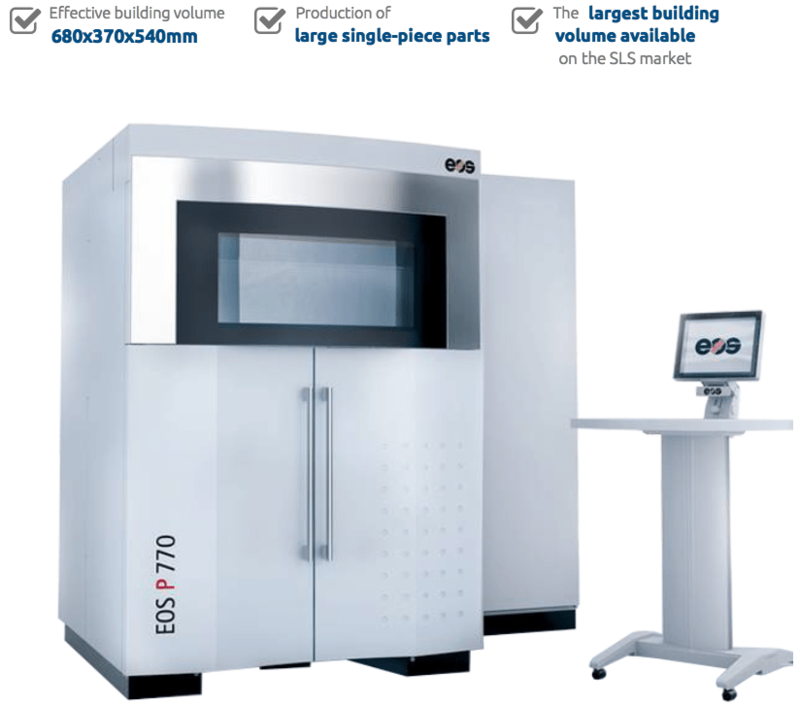 With an actual building volume of 300x300x600 mm, this highly productive system allows the manufacture of serial components, spare parts, functional prototypes and models directly from CAD data.It ensures a high productivity and homogeneous part properties. The spot pyrometer accurately and continuously measures the temperature of the material layer to be exposed and allows an overall reduction of non-productive time down to 60%. With the low-wear, high-speed recoater, the material is applied faster with the same consistent precision, thus improving the build speed. Moreover, the powerful 70 W laser helps to boost the build rate. The SLA printing is a technology based on the photopolymerization of a resin placed in a vat, on which a laser emits a UV radiation to which the resin is sensitive, and traces high precision shapes layer by layer. It is used for all these projects that need high precision. Thanks to the stereolithography, it is possible to produce complex models in a high level of transparency. These characteristics make it suitable for the production of parts for the automotive, medical and consumer electronic sectors: particularly for lenses and car lighting, packaging, silicon mold models, wind tunnel tests and quickcast patterns. The parts made with resin through stereolithography have an optimal dimensional stability in the long term and functional properties that makes it one of the most requested prototyping processes. The parts made thanks to stereolithography lend themselves really well to superficial finishes such as sanding and painting and they are suitable supports for the application of metal inserts and screw threading.